Companies use different tactics to get obtain new clients. In the mold removal industry, a common technique is to request a free mold inspection. And while “free” might sound too good to pass up, it might not be your best option. Find out all about the drawbacks of a free mold inspection. Before you learn about the drawbacks of a free mold inspection, you should learn what a mold inspection involves. During a mold inspection, a specialist comes out to your house or place of business. They look for signs of mold and might attempt to identify the strains. After a thorough examination of your home, the company will give you the results. But this is the extent of the inspection. If you want mold removal, you need to pay for the services. The cost of this varies depending on the company you use and the severity of your mold problem. There are no federal laws that dictate when a house passes or fails a mold inspection. Because it is an unregulated area, mold inspections can be risky. You’re better off paying for testing through a regulated, professional company. 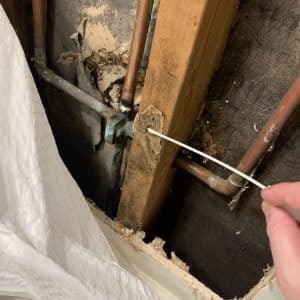 Why Shouldn’t You Get a Free Mold Inspection? Every state has unique laws regarding mold removal. In Texas, you cannot receive mold removal from the same company that did your mold inspection. This is to keep companies from taking advantage of consumers. If the same company were to provide both services, they wouldn’t have your best interest in mind. After all, what benefit would they receive from a free inspection that revealed no mold? They wouldn’t make a profit. Therefore, companies that offer both have a conflict of interest. If a company offers a free mold inspection, they are likely going against Texas laws. This could be reason enough for you to turn elsewhere for your mold inspection needs. We provide our services to areas outside of Texas including the coastal Carolina’s. Specially; Wilmington, Jacksonville, Myrtle Beach, Charleston, Bald Head Island, Raleigh and Fayetteville. As of current the Carolina’s do not have any laws regulating mold inspections or mold removal. Regardless we provide inspections to the Carolina’s with the same thoroughness as any state that does have regulation. Before a inspector can do any inspections in the Carolina’s they must fist become licensed in the state of Texas. Providing our customers with the best in quality inspections and free of any conflicts of interest. If a company offers a free mold inspection, it’s unlikely that they are giving you the best. Often, things that sound too good to be true are too good to be true. Thorough mold inspections aren’t cheap. A company that offers high quality inspections needs costly equipment and skilled workers. For that reason, they can’t afford to offer free inspections. When you receive a thorough inspection, you get more accuracy. You can learn exactly what types of mold are in your home. Furthermore, you can find out where your mold is coming from. When you do hire a mold testing specialist in Houston, you can get better results. Unfortunately, free inspections don’t involve precision. The specialist might tell you that you have mold, but they might offer no other specifics. It’s also likely that they have less training, which causes inaccurate results. Typically, a free mold inspection is more costly than a paid one. This is due to the inaccurate nature of free testing. If you have a mold problem that goes undetected, you could be in for thousands of dollars worth of damage. Mold spreads quickly. Failing to diagnose the problem early on means it will only get worse. As the problem progresses, the cost of repair only increases. It could also cost you more in medical bills. If you have a mold problem, your health could suffer. This is especially true of black mold. When your testing misidentifies or fails to identify a harmful strain of mold, you have to deal with the health consequences. As a result, you could have expensive medical bills. These days, most people are targets for scammers. Regardless of your age or situation, you could be a victim of a scam. Some companies offer free mold inspections and try to take advantage of you. For instance, some businesses shake out rugs and pillows to release more spores into the air. The result is higher mold concentrations throughout your home. Other companies use gimmicky equipment that don’t actually get the job done. This point comes back to the lack of regulation in the mold inspection industry. If a company wants to make money off of you, they could argue that you have more mold than you actually do. To remedy your “problem”, you could spend money in unnecessary mold remediation. If you work with a reputable company that offers thorough inspections and testing, you have less to worry about. Often, a company’s reputation speaks for itself. You can avoid a scam by working with a professional who has a track record of success. In many states, there are no legal standards for mold inspectors. However, there are certifications and licenses available in some states. In Texas, mold inspectors can be licensed and certified. Often, the qualifications require continuing education. By working with a licensed or certified inspector in Houston, you can ensure that you have a fully qualified professional. That said, most free inspections aren’t done by certified professionals. Rather, they are done by people who have little professional experience. This can hurt you in the long run. Some companies pride themselves with homemade certifications. Others will use a certificate given to them from a online training company. If the certificate is not recognized by the state it is as good as scrape paper for the kids to draw on. If you have moisture in your home, mold will continue to grow. But not all mold inspections include a moisture inspection. You could have no mold, but high moisture. Eventually, mold will start to grow and take over. A moisture inspection is a key part of a mold inspection. If you get a free inspection, it is unlikely to include any moisture testing. Once again, you could get the wrong information. If you want to make the most of your mold inspection, you need to pay for it. It might cost you more than the free inspection at first, but it will save you money in the end. Contact AWA Environmental Mold Inspections to learn more about a high qualified inspection from a licensed professional. Don’t put off your mold problem any longer.